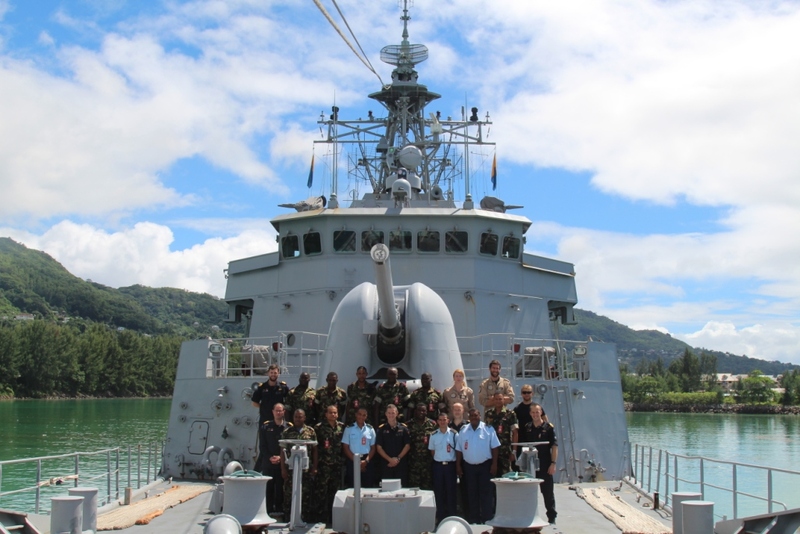 Her Majesty New Zealand Ship (HMNZS) Te Kaha, (TEK) New-Zealand’s first ANZAC class frigate, to be engaged in Combined Task Force 150 (CTF-150), was recently in Seychelles to work with the Seychelles Coast Guard, (SCG). This was part of the Task Force Maritime Security Operations training to constantly improve interoperability between allied maritime forces as well as to enhance their maritime security capabilities. The Seychelles Coast Guard with their hosts onboard TEK, at the buoy in the Seychelles. Seychelles and New Zealand are both part of the Combined Maritime Forces (CMF), which is the coalition which works together to ensure maritime security throughout the region. The Seychelles participate in combined training with many CMF ships. As a matter of fact, last month, SCG led several interactions with both CTF-150 Flagship French Ship (FS) Var and HMAS Newcastle, from the Australian Navy. Seychelles is a full member of the Coalition Maritime Forces (CMF) and is situated in the middle of significant sea lanes, adjacent to historic pirate and narcotic smuggling areas. Her growing Coast Guard is well placed to have a major impact on maritime security in the Indian Ocean. 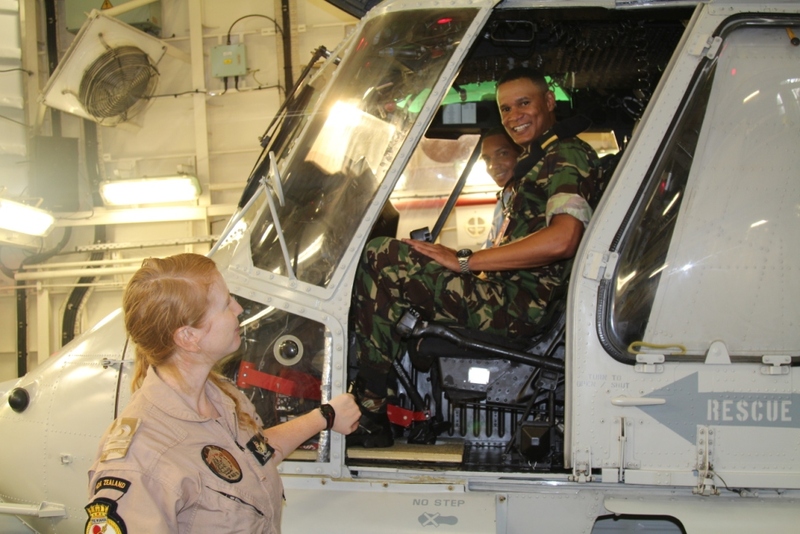 TEK’s Flight Observer LT Johnston showing members of the SCG TEK’s SeaSprite Helicopter. Among the different combined trainings and workshops led TEK and SCG were joint boarding exercises, Maritime Security and Joint Planning Workshop, Marine Engineering and Damage Control / Fire Fighting, and coastal surveillance. Te Kaha’s Boarding Team, with her embarked Naval Criminal Investigative Services (NCIS) agent, demonstrated techniques involved in conducting boarding’s and included the latest search equipment. SCG was also interested in learning about TEK weapons, including weapon stances adopted during different stages of the boarding. 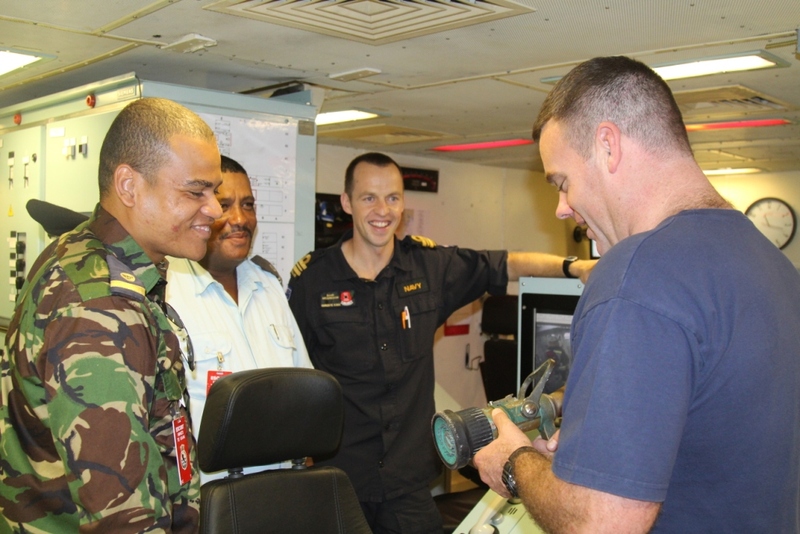 “Being able to discuss the challenges we have faced during boardings was really rewarding” commented one of TEK’s Boarding Officers, LT Sam Wilson, RNZN “they were keen to learn from us and were able to share their experiences of boarding in similarly challenging conditions”. 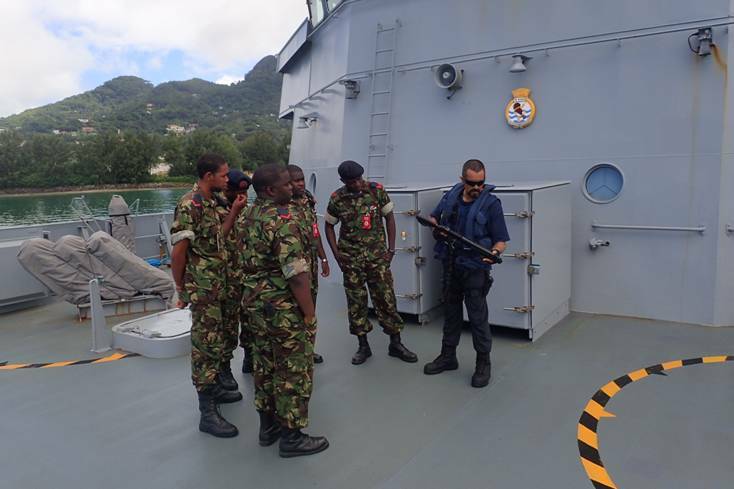 Having the former J53M (staff officer responsible for planning major fleet operations) onboard TEK meant that a Seychelles/New Zealand maritime security comparative workshop could be conducted and it allowed the free exchange of concepts and experiences. ”Our two island nations have a lot in common: Large Exclusive Economic Zones and Search and Rescue regions, secured by relatively small resource bases. This was an excellent opportunity to share our common challenges” said Lieutenant Commander (LtCdr) Peter Bowmar, RNZN. Back to basics: TEK’s Marine Engineering Officer LtCdr Scott McGregor with CPOCSS(A) Muddy Waters demonstrates some of TEK’s firefighting equipment to members of the SCG. TEK’s Marine Engineering Department did not want to be left out and very proudly showed off their new Battle Damage Command System during a fire exercise. The ship’s damage control instructors (NBCDIs) were also on hand to demonstrate fire fighting and damage control techniques. ”Although they were a bit more impressed with the shiny new flat screen BDCS than my demonstration of nozzles” said CPOCSS(A) Muddy Waters “as any old and bold NBCDI will tell you, you can’t forget the basics”. Not to be outdone, the flights were on hand to regale the SCG with their airborne exploits. Surface search procedures for localising suspect vessels were also discussed including sharing experiences of conducting surveillance where the aircraft is able to identify the vessel type without being seen which had been particularly valuable during TEK’s recent patrols. ‘We certainly had much to share; it was good to hear their experiences and I think they got a lot from our recent exploits” said Lieutenant (Lt) Jacinda Johnston, the Flight Observer. CTF-152, responsible for security and cooperation in the Arabian Gulf. Task Force’s mandate is about promoting the conditions for security and stability in the maritime environment by countering terrorist acts and related illegal activities, which terrorists use to fund their operations or conceal their movements. CTF 150‘s Area of Operation spans over two million square miles and includes some of the world’s most important and busiest shipping lanes, covering the Red Sea, Gulf of Aden, Gulf of Oman and Western Indian Ocean.